'Baymax is the perfect name for me. I am super cute, cuddly, and have tiney black eyes just like the Pixar character with the same name. I have really enjoyed getting used to life as an inside dog. I love chew bones, snuggling up with my foster brother, chew bones and toys. I also LOVE jumping on the trampoline. Sometimes I get up there all by myself because it is so much fun! Like many people in this area, I have bad allergies. I currently have them under control with a special grain-free diet, medication, and allergy shots. I have to avoid all grain since it's in the grass family and grass is what I am most allergic to. LBR, my foster family, and our amazing LBR vets have worked really hard to get my itchies under control. I am so relieved! I'm sweet, lovable, wiggly, and super smart! I have very mild hearing loss and hear high-pitched noises better than low sounds or low voices and sometimes can't tell where the sounds are coming from. I know how to walk like a gentleman while out on a stroll and how to do what my foster people ask me to do. I always do my business outside so our house stays nice and clean. I get along really well with my fur brother (another white Boxer) and his boy. I also love running in the yard, snacking on treats (diced apple, baby carrots, actually any dog safe fruit or veggie. I love my fruits and veggies!! ), sleeping on soft beds, and checking in with my foster people for loves. Like all goofy Boxers, I get the zoomies (sure to make you laugh) and wag my entire body to show you how happy I am. We've got to meet! I'm sure we'd be besties! If you are interested in getting to know me, all you have to do is let us know. XO, Baymax' See my complete bio at http://www.savetheboxers.com/available2.php?dogID=3001 If you are interested in adopting me, please fill out our adoption application to begin the process at http://savetheboxers.com/adoptionapp.php. 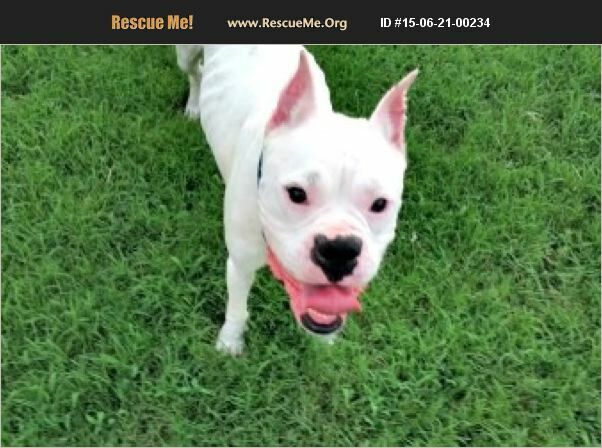 If you aren't able to adopt at this time, please consider making a much needed, tax-deductible donation to Legacy Boxer Rescue at http://savetheboxers.com/donate.php.